« Twitter, it turns out, is public. This will be my first in a series on my favorite burgers. Burgers are all the hype. From Hubert Keller to former Top Cheftestants, really good burgers or sliders are gaining a place in fast food and haute cuisine. I like burgers. I mean, they don’t even have to actually be good for me to like them. But I’m going to tell you about a few places that are worth it (but also not TOO expensive). 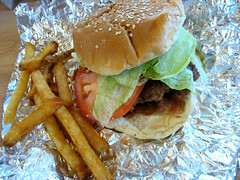 Five Guys makes a fast food burger– no question about it. But it’s better than your major chains. For one thing, you’ve got a lot of topping control. Really, most fast food restaurants have about 10 sandwiches– some beef, some chicken, maybe a veggie burger? But you have no idea what’s the difference between the 4 chicken sandwiches, and neither does the person taking your order half of the time either. Not so with Five Guys- 15 toppings, from grilled onions to jalapeno peppers, and you pick what you want on your burger (or hot dog, or, I guess, grilled cheese). Now, a hot dog with lettuce, tomato, and mushrooms is unusual at first thought, I admit. But I also have to admit that it’s both yummy and filling. The fries? Well, there’s some controversy. They’ve won awards. They give you a whole lot of fries. And a lot of the time, they’re very good. But they’re not always good. There are huge bags of potatoes stored all over the store, and there’s a sign that tells you where that days potatoes are from. Which means that there isn’t perfect consistency in their fries. Or at least that’s my best guess as to why some days the fries are BRILLIANT and why some days they’re only so-so. On any day, I still like them better than any of the big chains. The overall experience is still fast food like, even though they take a bit longer to get you your food since it’s cooked to order. There is no ambiance, each location has the same white with red accent decor, the chairs aren’t very comfortable. There are peanut scraps everywhere since there are whole peanuts available in big boxes for you to eat as you wait. If you are allergic to peanuts, avoid at all costs– in addition to the big boxes and scraps, the fries are cooked in peanut oil. But as fast food goes, it’s fun, cheap, easy to figure out what you’re ordering, and tasty. There’s a location finder on their website– while you’re tripping over them in the DC Metro area, they’re expanding slowly lots of other places, including into New England. So they cut the fries from the potatoes each day? Potatoes keep for a long time when they’re just sitting there uncut. There’s a lot that can go wrong even with factory made frozen fries, so I’m inclined to believe it’s fryer temperature, old oil, or employee error. FYI – If you find yourself back up in Northampton, Local Burger is the best burger place I’ve ever been to. Anthony– Very possible that there are other problems going on. But the fries seem more variable than any other place I’ve been to, even if I only compare fries from one location. Emma- One of the sad parts about Noho was the lack of burgers. Where is it/what did it replace?? Local Burger is next to Taipei and Tokyo, on the corner of Main St. and little-st-whose-name-I-don’t-remember. I’m not sure what was in there before. And I was only there once, but I was impressed. And I went with vegetarians, who were also impressed. Also, I’m amused by the message that my comment is awaiting moderation. Did they find it immoderate? I don’t know about Five Guys, but I do know about Four Burgers (http://www.fourburgers.com/) in Cambridge (near Central Square). I’d be curious to know your opinion of that place. I appreciate that they offer four basic types of burgers (beef, vegetarian, turkey and salmon) with variations on each. Marilyn and I enjoyed our meal there and definitely recommend it. Jeff- I’ve never been to Four Burgers- I mostly frequented b.good, Flat Patties and U Burger… and really mostly Flat Patties. Well, the next time you’re up this way, we should get a group of people together and (re)visit a number of these joints. We’ll eat. You review.